Adventures of Elis: RIVIERA DI LEVANTE, Italy. 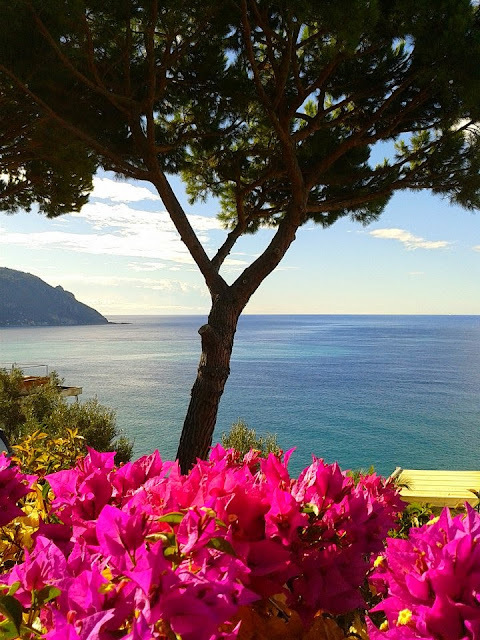 Perhaps the most striking aspect of the Italian Riviera is the vibrancy of the colours. Everything takes on a cheerful pastel shade from the deep blue hues of the Mediterranean Sea to the brightly coloured houses of the fishing villages which cling to its shores. All this is set against the backdrop of the lush green wooded hillsides of the Ligurian Apennines. This post will focus on the eastern end of the Ligurian coastline, known in Italian as the ‘Riviera di Levante’. This colourful stretch of coastline stretches between the historic seaport cities of Genoa and La Spezia, and is arguably one of the prettiest coastlines in Europe. The area often attracts the rich and famous, who are drawn in by chic resorts such as Portofino and Santa Margherita whose harbours are filled with luxury yachts. Just about every town or village along this coastline is worth a visit, but I’ll start by describing my personal favourite. 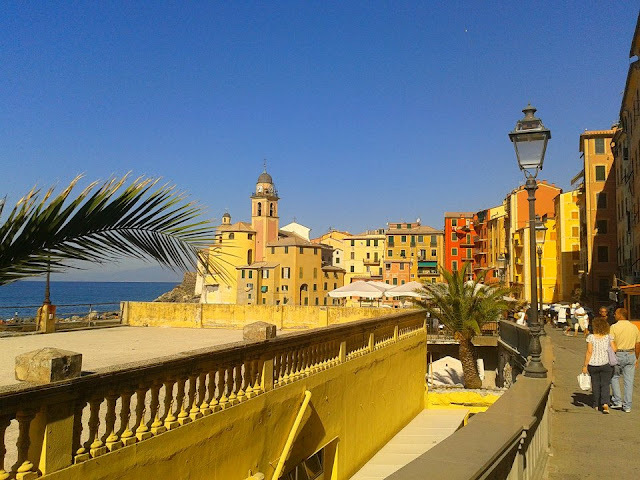 Clinging to steep hillsides at the southern end of the Golfo Paradiso, I fell in love with Camogli as soon as I arrived. The small town has been a busy fishing port for hundreds of years. The entire town is painted intricately with bright pastel colours; it is said that the tradition of painting the buildings bright colours emerged as a way of helping fisherman find their way back to the harbour! A rather interesting aspect of the town is the height of the houses, many of which tower up to nine stories above the narrow streets. An elegant promenade leads along the town’s seafront past the pretty pebble beach, and then through an archway to the harbour. Many bars and restaurants line the seafront, serving traditional Italian and Ligurian specialities. Whilst in Camogli, a worthwhile trip is the monastery of San Fruttuoso. Nested at the foot of Monte di Portofino, this secluded location is only accessible by boat or on foot. 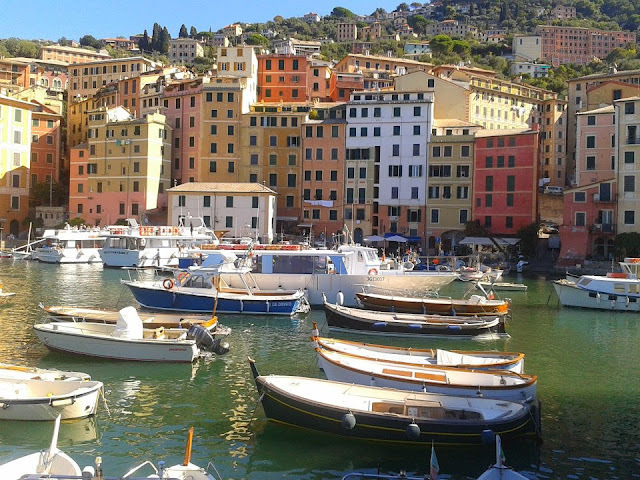 Although I didn’t visit San Fruttuoso myself, I understand there are frequent boat departures from the harbours of both Camogli and Portofino which are well-advertised throughout the area. Around the headland from San Fruttuoso is the Golfo del Tigullio. This section of coastline stretches from Portofino to Sestri Levante, and is home to the most exclusive resorts in the Italian Riviera. 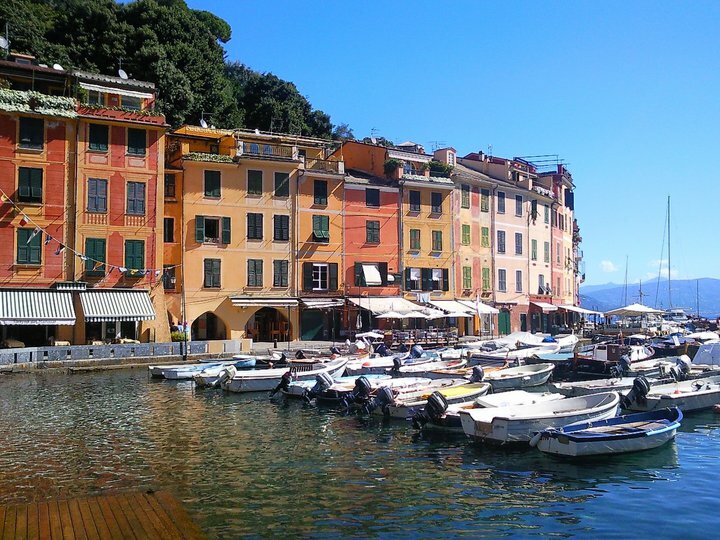 Perhaps the most famous of these is Portofino. This very attractive small town is nestled at the end of a long natural harbour filled with expensive yachts. Portofino is definitely worth a visit, however I advise staying outside of Portofino itself, as accommodation (and everything for that matter!) is extremely expensive in the town. 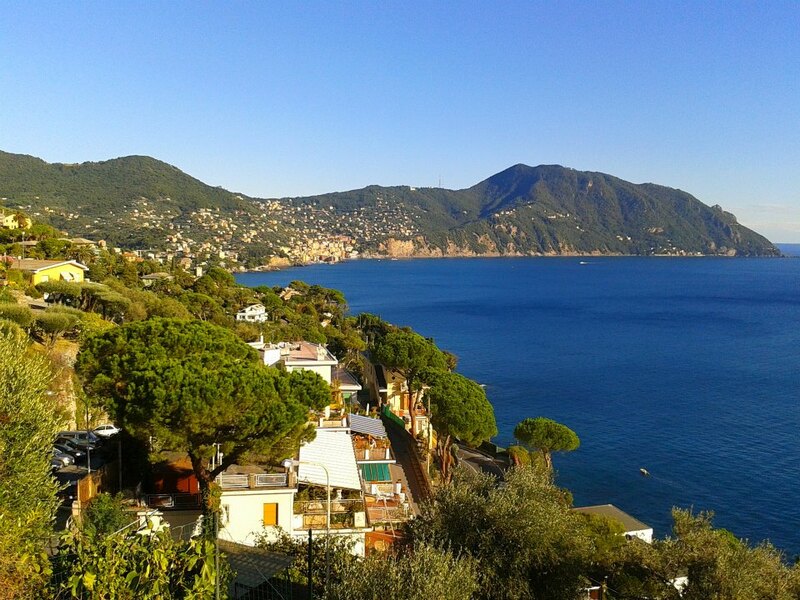 There’s only one road into Portofino – a very scenic road winds its way around the coast from Santa Margherita. However, the road is narrow and prone to congestion in busy periods. On top of this, parking spaces fill up quickly and are very expensive. Perhaps the best way into town is by boat – regular services leave for Portofino from most of the surrounding towns. Each building is a work of art! Around the coast from Portofino is the charming town of Santa Margherita Ligure, which is slightly larger than Portofino, but no less luxurious! Other places worth seeing in this stretch of coastline are Rapallo, Zoagli and Sestri Levante. Rapallo is a larger town, and has a busy, lively atmosphere. A weekly market is held in the town, which is pleasant to stroll around. Zoagli is a quiet fishing village, built around a pretty pebble beach. Sestri Levante is a relatively large resort town, built on a small headland. On entering Sestri, you will first encounter the new town, which is rather unattractive, but don’t let this put you off – the historic centre of town is beautiful. 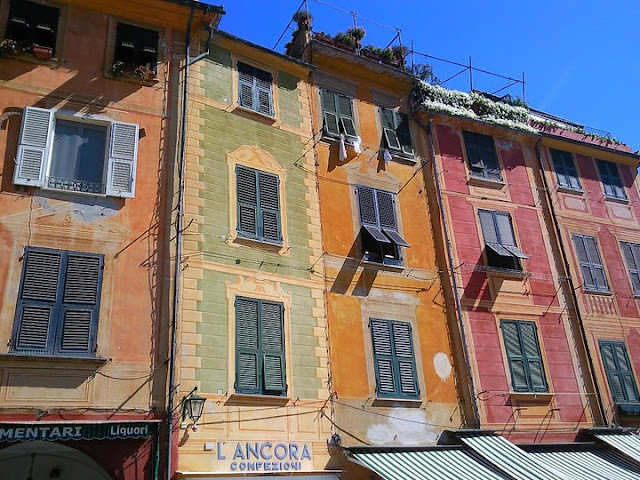 It has a typical Ligurian feel with its narrow streets lined with pastel coloured houses, restaurants and cafés. Sestri Levante hides a hidden gem; tucked away behind the historic town is the sandy beach of Baia di Silenzio. This is one of the few sandy beaches along this section of coastline – most beaches are pebbles or shingle. Further south is the stunning landscape of the Cinque Terre, which translates to ‘Five Lands’ in English, and refers to the five main villages – Riomaggiore, Manarola, Corniglia, Vernazza and Monterosso al Mare. The unique scenery and rich cultural heritage of the Cinque Terre has led to its protected status as a national park, and a UNESCO world heritage site. This stretch of coastline is dominated by particularly dramatic, rugged scenery with mountains plunging steeply into the sea. 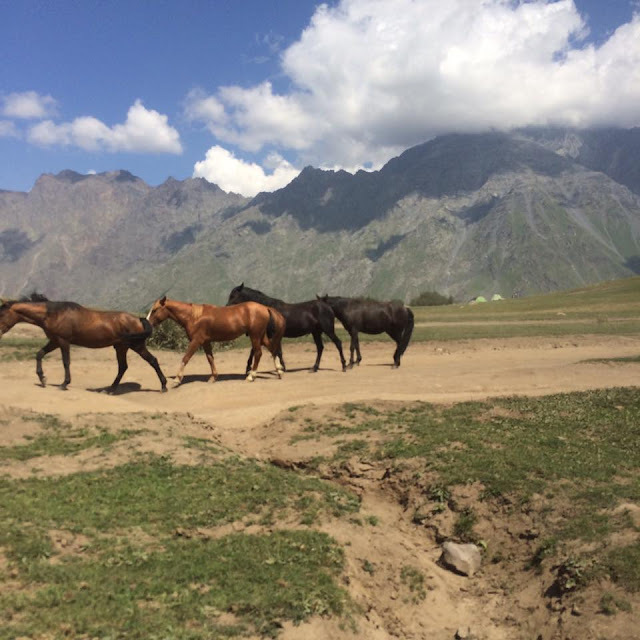 It is hard to imagine how near-vertical slopes can be used as productive land, but it has in fact been farmed for hundreds of years by means of a series of terraces leading up the mountainsides. 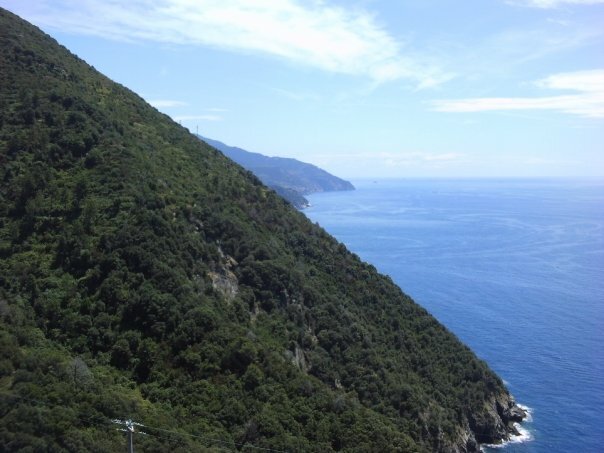 Although there is a road linking the park to Levante in the north and La Spezia in the south, travelling by car in the Cinque Terre is rather difficult, because the main villages are car-free (with the exception of Monterosso, which is larger and more accessible). It is possible to park above the villages and walk down the hill, but be prepared for some walking! Probably the best way to get around is by train or by boat. A railway line connects all five villages to the rest of Italy; this runs in tunnels for most of its distance as to not ruin the scenery. Most mainline trains stop at Monterosso, but local trains should be used to access the other five villages. Boats call at most villages, and leave from Genoa, Portovenere, La Spezia and Lerici. Although technically not part of the Cinque Terre, the nearby village of Portovenere has a very similar feel and is certainly worth visiting. It is also protected under the Cinque Terre UNESCO world heritage site area. Portovenere is slightly larger and more accessible by road, whilst managing to retain the same charm as the Cinque Terre villages. A large castle stands above the village, and the long harbourside is line with pastel coloured houses. It is built at the tip of the Gulf of La Spezia, which is more affectionately known as the ‘Gulf of Poets’ (Italian: ‘Golfo dei Poeti’) so called because of the numerous poets and writers, including Byron and Shelley, who drew inspiration from the area. The end of the bay is dominated by the busy seaport city of La Spezia. 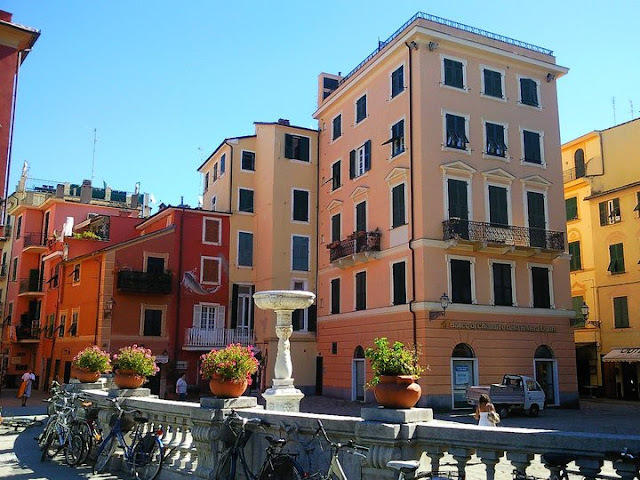 Whilst in the area, I would recommend visiting the surrounding coastal villages rather than the city of La Spezia itself; the busy atmosphere of La Spezia doesn’t offer the same charm. On the other side of the bay, Lerici, Tellaro and San Terenzo are pretty coastal villages which are pleasant to visit. Lerici is probably the best beach resort in the area – the town’s sandy beach is easily accessible and is made up of both public and private sections. Owing to its maritime heritage, seafood features a lot in Ligurian cooking. Those who like fish and shellfish will be spoilt for choice! However, there is also plenty of choice for fussy eaters like myself who don’t like seafood! My personal favourite dish is ‘trofie al pesto’, a local pasta dish which you will find on every menu! Italian ice cream ‘gelato’ is amazing; it is available in all flavours imaginable, and you will find ice cream shops ‘gelaterie’ around almost every corner. Although not specifically from this region of Italy, the pizza here is fantastic and can be found everywhere!! Travel to the area is easy – the closest airport is Genoa which offers has regular flights from London airports. Further afield, the airports of Pisa and Nice are served by budget airlines, but are both about 2 hours by car from the Riviera di Levante. The entire coastline is very accessible by train; a railway runs parallel to the coastline linking the towns to the rest of Italy and other parts of Europe. TThis post will be followed in the coming weeks with an account of Sorrento and the Amalfi Coast of southern Italy. As always, thanks for reading and happy travels!